This post was contributed by guest bloggers, Wenning Qin and Haoyi Wang. CRISPR/Cas9 is revolutionizing the mouse gene-targeting field. Mice have long been extremely useful in the lab – they are relatively small and easy to work with, making them the go-to choice for studying mammalian biology. Similar to any model, mice are not without their problems, but much genetic and physiological data have been accumulated over the years using them. Indeed, the future of mouse work is bright as it is now easier than ever to manipulate the mouse genome using CRISPR/Cas9. Similar to the human genome, the mouse genome is made up of 3 x 109 nucleotides (nt), and encodes 23,000 or so genes. It would be great if we could just go in and quickly manipulate individual mouse genes and study their function in health and disease, but, until recently, it just wasn’t that easy. In the 1980s, gene targeting technology was invented to introduce specific changes into the mouse genome. With these early technologies, a researcher would first introduce a mutation into a mouse embryonic stem cell (ESC) line, enrich and select for cells that had successfully incorporated the desired mutation, and then derive mice from these engineered ESCs. To do so, the engineered ESCs would be injected into developing mouse embryos, the embryos allowed to develop into chimeric mice (with a fraction of the cells in the adult mice derived from the engineered ESCs), and chimeric adults mated to produce completely transgenic offspring. Although powerful, this technology is cumbersome to use, not that efficient, often takes more than a year to generate a mouse model, and its success is not always guaranteed. 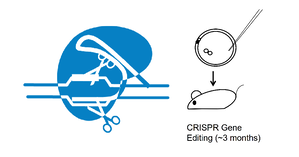 Everything changed with the advent of CRISPR in 2013 (Cong et al., 2013)! Haoyi got his first exposure to CRISPR when he used this new technology to engineer mouse models (Wang et al., 2013, Yang et al., 2013). Like everyone else in the world, I (Wenning) was fascinated by CRISPR and rushed to test it. I still remember the day, March 16, 2014, that I got my first preliminary results from a CRISPR genome editing experiment. I was in my office and opened a sequence file. Then I saw it, the chromatogram showing the telltale signs of a mutation introduced by CRISPR. The sequence started clean and then, about 100 bps into the run, it got “dirty”, with multiple sequence traces overlapping each other! When the count was done, 75% of the mice in this experiment showed a mutation! I looked out my window and I saw the Dorr Mountain with the rest of the skyline of Acadia National Park. I was confused. It was supposed to be hard. I was mentally prepared to go through a learning curve that would result in success only after many attempts. Was I really successful in my first attempt at using CRISPR? Later on, I found out that my experience was shared by many others around the world. Yes, finally, we have a technology, CRISPR, that is simple in concept, straight forward to use, and robust in performance. In its natural setting, CRISPR-Cas9 is an acquired immune system in bacteria and archaea. As you know well if you’ve been following the Addgene blog, it has been repurposed for genome editing in eukaryotes, with the most widely used CRISPR genome editing system derived from Streptococcus Pyogenes (SP). For editing the genome, this system makes use of 3 components, a guide RNA (gRNA) of about 125 nt that specifies the target, the Cas9 endonuclease that creates the DNA double-strand break (DSB) at the target site, and a donor oligonucleotide or plasmid as the repair material if needed (for knock in models). Catch up on all your CRISPR background with Addgene’s CRISPR Guide. To create a mouse model, the gRNA, Cas9, and donor oligonucleotide or plasmid components are brought together and injected into either the pronucleus or the cytoplasm of fertilized mouse eggs. Alternatively, the gRNA, Cas9, and donor oligonucleotide can also be electroporated into the mouse zygote (Qin et al., 2015). When inside the zygotes, the gRNA will seek out its target among the 3 X 109 nt of genetic content in the mouse genome and the Cas9 enzyme will make a cut at the target site. This is when it gets exciting – the cell sends out an “SOS” signal and cellular repair mechanisms rush in to repair the damage. If all they can do is stitch the two broken ends together through non-homologous end joining (NHEJ), this will leave behind a “scar”, with nucleotides missing or added at the broken ends and, as such, cripple the gene. However, if repair material is provided (in the form of an oligonucleotide or plasmid), precise changes can be made in the genome via the homology directed repair pathway (HDR), be it a single nucleotide change, insertion of a reporter gene, or replacement of the murine sequence with a human gene. From the very start, generating mouse models using CRISPR is easier than more conventional methods. Time and money savings come from the fact that CRISPR is so efficient that you can inject the reagents directly into fertilized mouse eggs, circumventing the need for enrichment and selection offered by mouse ESCs. For example, we often screen only 15-25 mice when generating knockout models with CRISPR and find that many, if not all, the mice carry a frameshift mutation. For knock in with a donor oligonucleotide, we aim to generate 50 to 100 mice and are usually successful in deriving mice carrying the intended mutation. With a donor plasmid, the outcome is less predictable. In our best case, we saw that 2 out of 3 mice carried a 5 kb insertion in the ROSA locus as assessed by Southern blot. From the efficiency discussed above extends the 3 major advantages of CRISPR mouse editing when compared to more conventional methods. First, one can work with almost any strains of mice, as compared with conventional gene targeting, which is limited to a few strains, including 129 and C57BL/6, for which we have germline competent ESC lines. Second, the process is much quicker. 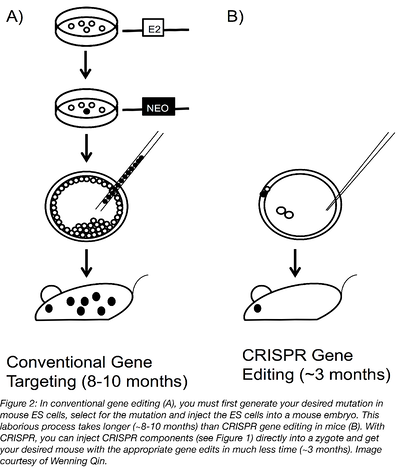 It takes 3 months to generate founder mice using CRISPR, as compared with 8 to 10 months going through conventional gene targeting. Lastly, it costs less. With CRISPR, it may cost about $5,000 to generate founder mice, while with conventional gene targeting, the cost may be $50,000. Although CRISPR is incredibly useful for generating mutations by NHEJ and generating small mutations with HDR, when it comes to larger scale genome editing, such as replacement of a mouse gene with its human ortholog (greater than 5 kb), it remains to be seen whether CRISPR is as robust as conventional gene targeting. In our hands, experiments incorporating fragments larger than 5 kb can be more challenging. Also when working with CRISPR, one must beware that not all gRNAs are created equal. Some work better than others. There are a variety of resources online to guide you in gRNA design. We have been using Benchling, but there are many other gRNA design tools available and you can get some additional advice from John Doench’s recent gRNA design blog post. Finally, always remember that you are working with RNAs, which are prone to degradation by the omnipresent RNase. You may want to declare your bench “RNase free” and refrain from talking to friends and colleagues while working with these reagents. Other than that, be nice to your microinjectionist, who has the strategically important job of delivering the payload! Last but not least, when using CRISPR, remember to appreciate the fact that it was first discovered in an obscure bacterium and that we still have much to learn from biology in all its forms! Many thanks to our guest bloggers, Wenning Qin and Haoyi Wang! Wenning Qin is a molecular biologist with Biogen and is particularly interested in applying CRISPR for mouse genome editing. Haoyi Wang is a professor at the Institute of Zoology, Chinese Academy of Sciences, and he is interested in using CRISPR to develop therapeutic applications that better human health. 1. Doench, J.G., Hartenian, E., Graham, D.B., Tothova, Z., Hegde, M., Smith, I., Sullender, M., Ebert, B.L., Xavier, R.J., and Root, D.E. 2014. Rational design of highly active sgRNAs for CRISPR-Cas9-mediated gene inactivation. Nat Biotechnol 32:1262-1267. PubMed PMID: 25184501. PubMed Central PMCID: PMC4262738. 2. Cong L., Ran F.A., Cox D., Lin S., Barretto R., Habib N., Hsu P.D., Wu X., Jiang W., Marraffini L.A., Zhang F. Multiplex genome engineering using CRISPR/Cas systems. Science. 2013 339(6121):819-23. PubMed PMID: 23287718. PubMed Central PMCID: PMC3795411. 3. Yang, H., Wang, H., Shivalila. C.S., Cheng, A.W., Shi, L., Jaenisch, R. 2013. One-Step Generation of Mice Carrying Reporter and Conditional Alleles by CRISPR/Cas-Mediated Genome Engineering. Cell 2013 154:1370-1379. PubMed PMID: 23992847. PubMed Central PMCID: PMC3961003. 4. Qin, W, Kutny, P. M., Maser, R. S., Dion, S. L., Lamont, J. D., Zhang, Y, Perry, G. A., Wang, H. 2016. 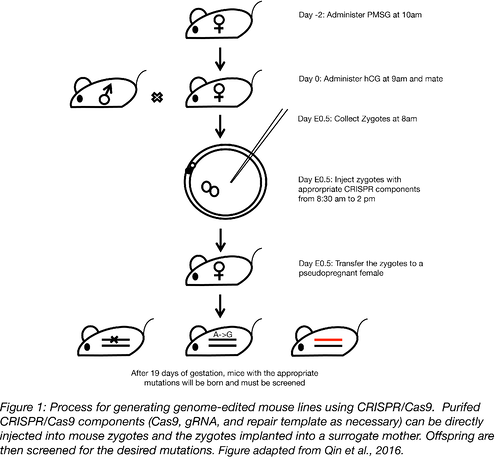 Generating Mouse Models Using CRISPR-Cas9-Mediated Genome Editing. Curr. Protoc. Mouse Biol. 6:39-66. PubMed PMID: 26928663. 5. Qin, W., Dion. S.L., Kutny, P.M., Zhang. Y, Cheng, A.W., Jillette, N.L., Malhotra, A., Geurts, A.M., Chen. Y.G., and Wang. H. Efficient CRISPR/Cas9-Mediated Genome Editing in Mice by Zygote Electroporation of Nuclease. Genetics 2015 200(2): 423–430. PubMed Central PMCID: PMC4492369. 6. Wang, H., Yang, H., Shivalila, C.S., Dawlaty, M.M., Cheng, A.W., Zhang, F., and Jaenisch, R. 2013. One-step generation of mice carrying mutations in multiple genes by CRISPR/Cas-mediated genome engineering. Cell 153:910-918. PubMed PMID: 23643243. PubMed Central PMCID: PMC3969854.